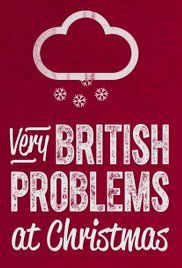 Very British Problems is a show based on a book based on a Twitter account, but don’t write it off because of that. It stars an array of comedians and celebrities, mostly British with a few from elsewhere who frequently work or live in Britain. These folks give short accounts to the camera of their experiences of the unwritten social rules of British society. A narrator provides context and ties the different interviews together under various broad subjects. If you’ve seen the first season, there isn’t much in this Christmas special that isn’t addressed elsewhere, but if you haven’t, it’s probably a fine sample of the series. The accounts of ridiculous social awkwardness around gift exchange or hosting a party are amusing because all the speakers have a sense of humor about it. It can also be heartening to those that have been there. I’ve read accounts of folks who have social anxiety finding this show reassuring -- hearing that other people (most of a country) feel the same way about, say, how to leave a boring party. There were a few points of specifically Christmas interest for us, including descriptions of British Christmas traditions and philosophies about travelling at Christmas. While I find this show more “amusing to have on” than “worth seeking out,” it’s entertaining enough, much like a fine-but-not-great holiday get together.